Visteon said today it exited bankruptcy with about $600 million in debt, compared with about $2.7 billion when it entered protection. DETROIT (Bloomberg) -- Visteon Corp., once the second-largest U.S. maker of auto parts, emerged from bankruptcy protection Friday after reducing its debt by about $2.1 billion. More than 40 bondholders, including the distressed-investment units of Deutsche Bank Securities Inc. and Goldman, Sachs & Co., and hedge fund manager Stark Investments, agreed to invest $300 million in Visteon and buy $950 million of new shares when Visteon exits bankruptcy. Visteon strengthened its balance sheet while in bankruptcy and had $979 million in cash as of June 30. The company received 39 percent of its revenue in Asia last quarter, up from 17 percent in 2005, which should appeal to investors, said Kirk Ludtke, an analyst with CRT Capital Group LLC in Stamford, Conn.
Visteon, a former division of Ford Motor Co., filed for protection from creditors in May 2009, citing the faltering economy and slowing auto sales. The company said Friday in a statement that it exited bankruptcy with about $600 million in debt, compared with about $2.7 billion when it entered protection. U.S. auto sales fell to a seasonally adjusted annual rate of 9.34 million in February 2009, less than half the 20.7 million rate from July 2005, as a global recession, job losses and declining home values and stock prices caused consumers to slow spending. Automakers and suppliers representing 38 percent of the North American auto industry, including General Motors Corp., Chrysler LLC and Lear Corp., filed for bankruptcy protection in 2009, according to consulting firm AlixPartners LLP. Visteon, which makes heating and air-conditioning systems, door panels and engine-cooling systems, had sales of $6.69 billion last year, 66 percent less than its peak year of 2000. The company, led by Chief Executive Officer Don Stebbins, employs about 26,000, compared with 82,000 in 1998. About 1,200 of the remaining workers are in the U.S., and it has one factory in the country, in Shorter, Ala.
Visteon was spun off from Ford in June 2000 to give it more freedom to sell to other automakers. Ford accounted for 88 percent of its $19.4 billion in revenue the year before the spinoff. The supplier followed a path similar to Delphi Automotive LLP, once the largest U.S. auto-parts maker, which was spun off from GM in 1999 and declared insolvency in 2005. Delphi exited bankruptcy in October 2009. 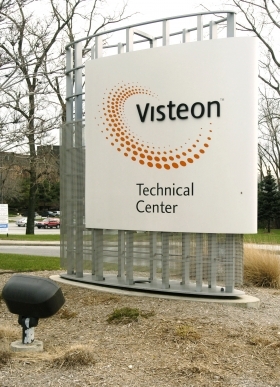 Visteon was hurt by higher labor costs. In 2005, trying to end five years of losses, Visteon returned 23 plants and offices to Ford and shed responsibility for 18,000 workers represented by the United Auto Workers union. That allowed Visteon to lower its average hourly wage to $18 from $38 in 2005. The company closed or divested 30 factories or units from 2006 to 2008 and trimmed its reliance on Ford to 28 percent of sales last year. Visteon has reported one annual profit as an independent company. Ford and Hyundai Kia Automotive Group, Visteon's largest customers, represented 55 percent of last year's revenue. No other customer makes up more than 10 percent of sales. Visteon received 38 percent of its revenue last year from the U.S. and 35 percent from Asia, including 24 percent in South Korea.